Cats Hostel Madrid Sol i Madrid, Spania: Bestill nå! Cats Hostel Madrid Sol has been described by Hostelworld guests as a lively party hostel, with a highly-praised Paella Party on weekends, plus a bar downstairs. Our visitors have recommended that guests 'definitely do the walking tour and tapas tour' to get to know Madrid. The hostel is centrally located, near La Latina, Puerta del Sol and the Prado Museum. We like their Andalucían riad-style courtyard, which many reviewers have called 'totally beautiful'. 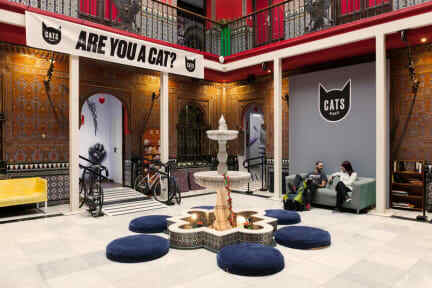 There’s no better way to visit Madrid than with a stay at Cats Hostel Madrid Sol. We have been creating unforgettable travel experiences for 15 years, which makes us experts! Our guests agree that our central location, comfortable beds, and a vibrant party atmosphere will leave you wanting more! From our door, you can easily reach on foot the city’s most famous sites, like the beautiful Plaza Mayor, the lively Puerta del Sol or the world-famous Prado museum. And after a long day exploring out, there’s nothing like arriving at our facilities, recently renovated and perfectly prepared a good rest. We have a wide variety of common areas to relax or socialize with other travelers. You can lie down in our comfortable sofas, watch a movie in the Red Room, or try our own Cats craft beer in our bar... The building will leave you speechless, it was at one time a 17th-century Spanish palace, and still retains its patio style Andalusian. The rooms are comfortable, functional and prepared for 21st-century travelers, with personal lockers, reading lights and power outlets and USB outlets. You can choose between shared dormitories from 4 to 14 beds or book your own private room! And what can we say about our activities? If we have to define us in a few words, we would say we are a very social hostel. Our most popular activities are the city walking tour, tapas tour, and of course our famous pub crawl. Every night we visit the best bars in the center, being this the perfect moment to meet other travelers and mix with the locals. But there's even more: depending on the season and the day, we will have karaoke nights, dance lessons and paella cooking show. The hard thing won’t be choosing what to do, but what not to do! We offer a buffet breakfast for only € 5 and we have towels to rent for € 3. Free Wi-Fi is available in all the hostel and there are also available computers for guest use. On departure day, we have secure luggage storage where bags can be left while you get your last tastes of the city! Our 17th-century Andalusian/Moorish patio definitely sets us apart from other hostels in Madrid. We're the only hostel in the city with its own nightclub, plus we've got free Wi-Fi, air conditioning and more. We're located in the centre of Old Madrid, just one minute from Madrid's best nightlife, which we highly recommend to all our guests. A five-minute walk from the hostel will bring you to Puerta del Sol and Plaza Mayor. I especially recommend Puerta del Sol if you're looking for the best shopping area.